BELIZE CITY, Wed. July 1, 2015–A man who first posed as a Good Samaritan by offering assistance to a uniformed police constable, but who at the first available opportunity, allegedly almost bludgeoned the police constable to death before stealing his car, was remanded to prison after he was arraigned on attempted murder, robbery, and other indictable charges this afternoon. 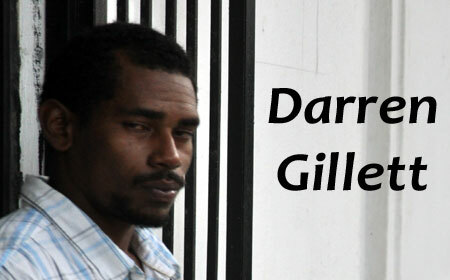 An enraged Darren Gillett lunged at Amandala’s court reporter’s camera and had to be restrained by a court police officer who was leading him to the courtroom of Chief Magistrate Ann Marie Smith. Gillett, who was undefended by an attorney, did not have to enter a plea after the Chief Magistrate arraigned him on the charges. The court prosecutor objected to bail for Gillett on the grounds that the virtual complainant, whom he attempted to murder, PC Jason Hall, remains hospitalized in a critical condition. Objection to bail was also made on the strength of the prosecutor’s case against Gillett and also on the basis of the fact that he escaped from police and is therefore considered a flight risk. Smith upheld the prosecutor’s objection to bail and remanded Gillett to prison until his next court date on August 4. Police reported that on Monday, June 29, they visited Rhaburn Ridge, located at Mile 37 on the Philip Goldson Highway, where Constable Jason Hall almost lost his life in a vicious attack. The police report said Hall, in uniform, had stopped at Rhaburn Ridge to repair a flat tire on his Mazda sedan. While he was repairing the tire, a man went to assist him. It turned out, however, that the man who had stopped to assist the policeman had other intentions. The “Good Samaritan” waited for an opportunity to strike and when he launched his attack, it almost cost Hall his life. Gillett pounced on the unsuspecting cop and used a gas tank to bludgeon him, court documents revealed. Once the cop was down, Gillett made off in his (Hall’s) Mazda. The seriously injured Hall managed to get help after a passing motorist rendered aid, and he was transported to the Northern Regional Hospital, in Orange Walk Town. Police recovered Hall’s Mazda on Pine Street in Orange Walk Town.